Two years ago I hosted a morning coffee for the wonderful Mothers and friends that shared many of the same life experiences. Mothers everywhere are hustling and bustling 24×7, seldom taking time for themselves. This annual coffee is now tradition, honoring these wonderful women, our friendships, and…our love of good food! The past two years, the coffee has been held on the Saturday before Mother’s Day. Somehow, this year, I ASSUMED that would be the first Saturday in May. You know what happens when you ASSUME! This year it’s a week early but what the heck! My friend, Barbara, is the official photographer for all of my gal pal gatherings, commonly referred to as ‘hot flash___’ (just fill in the blank for the actual event of book club, cards, yoga, etc.). 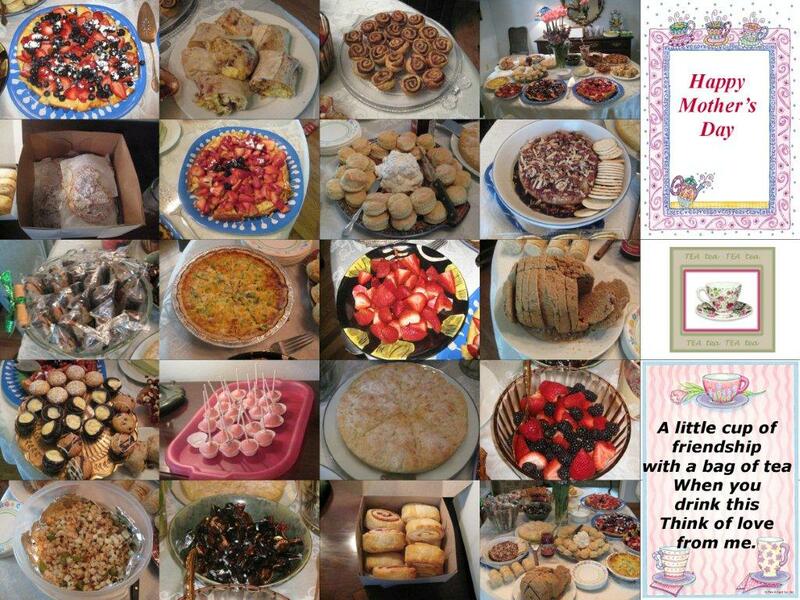 She did a wonderful collage last year capturing the great food we all shared that wonderful morning.